The awesome folks at Lucky Luke Brewing Co. and I worked together on this small market test. 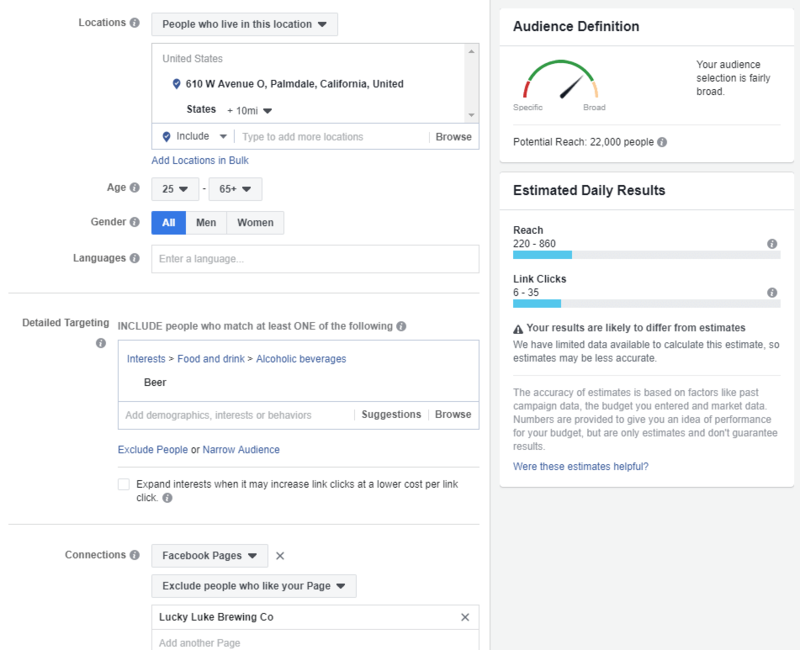 The goal of this test was to see whether or not Facebook’s “offer ads” are worth using vs. the tried and true method of sending traffic to the brewery website with a form where people would submit their email address in exchange for a coupon sent to them via email. The potential benefit of using Facebook’s offer ads is that by providing a unique coupon code to each person who claimed the offer there are no duplicate claims. There is no further set up, as you can let Facebook handle the delivery of the offer and reminders to redeem the offer before it expires. Additionally, the process of claiming the offer is very easy for users, as everything is done right on Facebook. 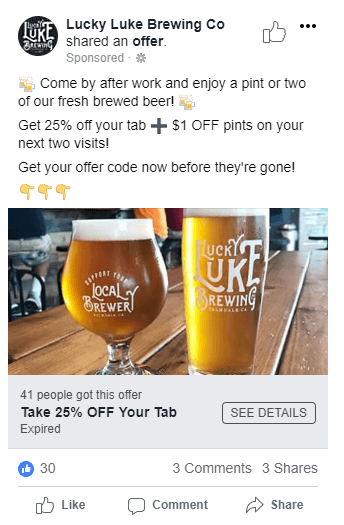 The drawback: no ability to collect email addresses or Facebook Pixel data via the brewery website for future marketing (Facebook doesn’t give you the info of the people who claim the offers). The concept is intriguing – the results, not so much. We ran this ad M-Th for two weeks to a cold audience (meaning people who don’t already like the brewery’s Facebook page) in a radius of 10 miles of the brewery. The only targeting used was ages 25+ layered with interest “Beer” (people who are more likely to enjoy beer of any type). The audience is relatively small (22k potential) so I didn’t want to narrow the targeting too much. The strategy in this targeting was to get people most likely to visit who aren’t already patrons. Additionally, the offer was structured in a way so as to help people who visit once to return a second, and even third time. Facebook’s offer ads are pretty buggy. For this test, we claimed the offer ourselves from a fresh account and were never sent a reminder to redeem – which is crucial to the success of the campaign, as people tend to forget to redeem coupons/offers before they expire. Even though Facebook says they will handle fulfillment, don’t trust them to do so. If you want to run offers on Facebook, definitely send the traffic to your website, pixel the visitors (for later retargeting) and collect addresses to place on your newsletter mailing list, etc. This ensures that even if people don’t redeem the offer you are still able to extract long-term value out of each sign-up. This article was originally published in our Facebook group. Sign up and get insight like this before it hits the blog. Subscribe to our mailing list and get the latest craft beer marketing tips sent to your inbox! Join our Facebook group and get advice to market your brewery. Join our Facebook group and get advice to grow your brewery. Is Your Brewery's Website Costing You Customers?